Sister Patricia Anne Clossey, center, is celebrated surrounded by Holy Cross associates and Sisters Joan Mader and Patricia Rodríguez Leal as she prepares to depart Monterrey, Mexico, in August. 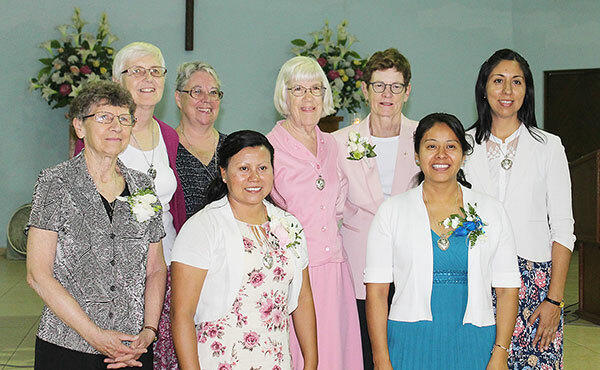 Sister Patricia, who initiated the associate’s group in Mexico, now is in Los Angeles, California, beginning a new ministry and a new group of associates. 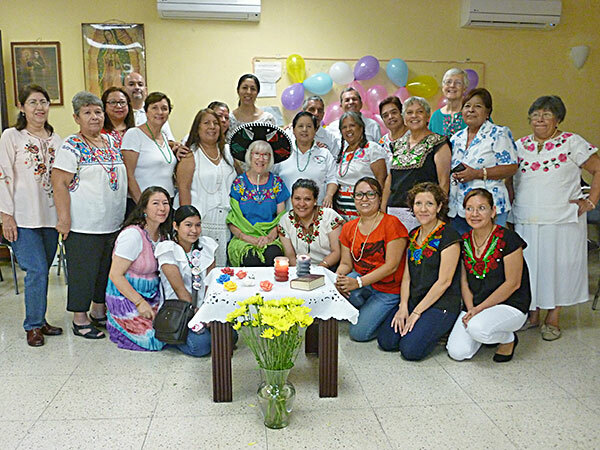 The Holy Cross Associates in Monterrey, Mexico, recently celebrated a milestone: 15 years of spiritual growth, prayer, encouragement and accompaniment with Sisters of the Holy Cross. They also bade a fond farewell to Sister Patricia Anne Clossey—who initiated the group in August 2003—as she prepared to leave for her new mission in Los Angeles, California. During the farewell send off, the associates shared memories of special moments with Sister Patricia and how she had impacted their lives. They expressed their wishes and blessings for her new mission, including the foundation of a new group of associates in Los Angeles. Finally, they sang and danced before sharing a potluck luncheon. Sister Pat enjoyed this special time thoroughly, as did the associates. Over the past 15 years that first small group of Holy Cross Associates grew from a few active people from La Luz Parish and from the other two parishes where the sisters had worked, to more than 30 people, with an extension group in Miguel Alemán, Tamaulipas, Mexico. The Monterrey group includes seven couples, as well as married and single women; all are active in ministry in their respective parishes. The associates appreciate the spirituality of Holy Cross and draw strength and mutual support by coming together for meetings, Masses and retreat days three or four times a year. They support the Congregation and one another with prayer, encouragement and inspiration. While they greatly miss Sister Pat’s presence among them, the Monterrey associates are moving forward with their meetings and encouraging the Miguel Alemán group to continue with the help of Sisters Joan Mader, Patricia Rodríguez Leal, Areli Cruz Hernández and Esperanza Jacobo Acevedo. That is where in fact the declaring arises from, should you desire for something hard enough it could only become a reality.